A headstone is located on Morayfields on the southern bank of the Caboolture River. 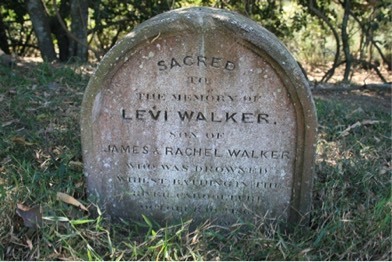 The headstone relates to Levi Walker, a labourer from Heap, near Bury in Lancashire, England, who drowned here in the Caboolture River in October 1869 (QRG 1869). Walker had only arrived in Australia 5 weeks earlier, aboard the Star Queen, on 6 September 1869 (QSA 2009). To date, no further evidence for burials on the site has been discovered through our scrutiny of historical records or archaeological evidence. Queensland Registrar-General (1869) Death Certificate 1869/6025. Queensland State Archives (2009) Registers of Immigrant Ships’ Arrivals 1848-1912, QSA ItemID 13086.